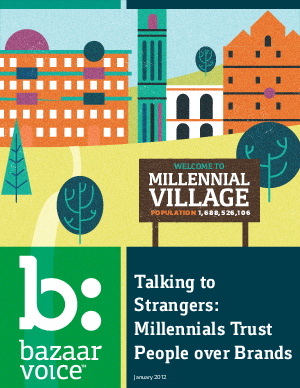 > Bazaarvoice > Today's Millennials trust strangers more than brands. Millennials represent more than just a huge market opportunity - they'll have more spending power than any other generation by 2017. They're also the bellwether for how all consumers shop - any mom who follows her teen on to Facebook is a hint to that. As early social media adopters, Millennials often understand social better than the brands trying to reach them, so they make their own rules of commerce. Millennials buy differently. Are you selling to them differently? Bottom line: It's time for brands to catch up - or perish.